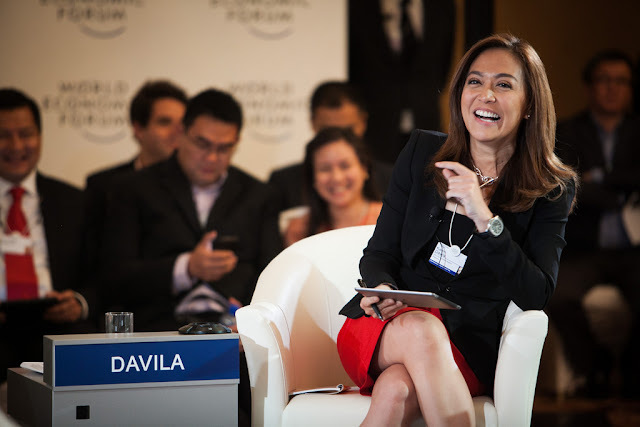 Home / Opinion / Int'l relations expert slams Karen Davila: "Isa kang major major journalist pero super minor minor ang research skills mo"
Int'l relations expert slams Karen Davila: "Isa kang major major journalist pero super minor minor ang research skills mo"
"How did you reach the top? I'm all for women on top." 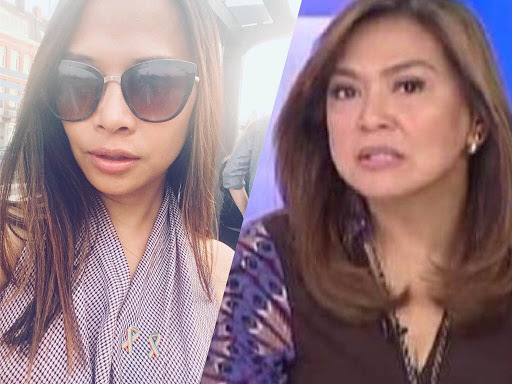 International relations expert and social media influencer Sass Rogando Sasot slammed veteran journalist Karen Davila who is also known as staunch critic of President Rodrigo Duterte for erroneously comparing the anti-religious remarks of Carlos Celdran and President Rodrigo Duterte. "Article 133 of the Revised Penal Code [the one that Celdran violated] only prohibits offending religious feelings “in a place devoted to religious worship or during the celebration of any religious ceremony.” Outside those contexts, religious feelings aren’t protected from being offended,” Sasot wrote in a Facebook post referring to her previous Manila Times article titled “on offending religious beliefs”. Sasot, a well known loyal supporter of President Rodrigo Duterte even pointed out how former Chief Justice Maria Sereno’s support for evangelist Bro. Eddie Villanueva’s stand on charging the President for mocking God as a violation of the Constitution is nothing but “hogwash”. The foreign relations expert explained how the President had merely exercised his freedom of speech by expressing an opinion about the Catholic Church whereas Celdran had blasphemed by mocking the Church in its very place of worship and during its religious ceremony. Sasot asserts that if anyone prohibits a person from expressing his/her beliefs and views on certain religions and deities, that is “tantamount to having a religious for freedom of expression” which is exactly what the Constitution prohibits. 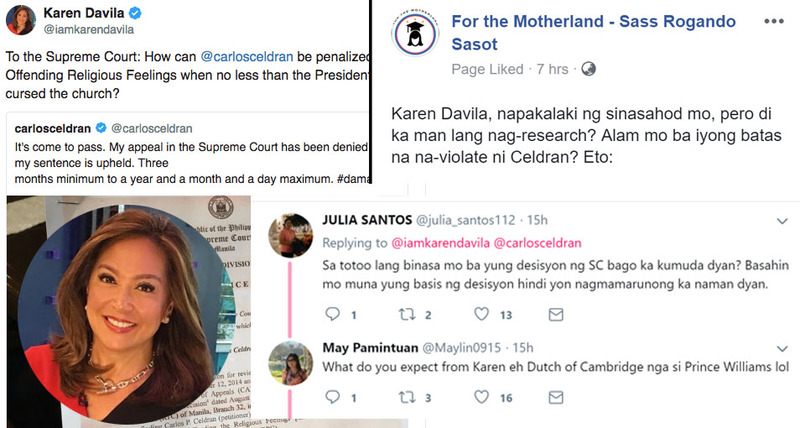 Davila’s mistake in treating the President’s blab as the same mistake as Celdran’s, which had the latter charged and jailed, warranted Sasot’s dismay over a journalist lacking research skills pertaining to the lack of educated opinion on the matter between Duterte and Celdran. “It has come to my attention na naguguluhan ka (Davila) bakit si Duterte eh hindi na penalize dahil he cursed the "church." Ako rin naguguluha sis at isa kang major major journalist pero super minor minor ang research skills mo. How did you reach the top? I'm all for women on top. Share mo naman ang skills mo,” Sasot said. The foreign relations expert underscored how the law does not prohibit cursing against the Church. It has come to my attention na naguguluhan ka bakit si Duterte eh hindi na penalize dahil he cursed the "church." Ako rin naguguluha sis at isa kang major major journalist pero super minor minor ang research skills mo. How did you reach the top? I'm all for women on top. Share mo naman ang skills mo. Nakakaloka ka teh. Di ba pumasok sa utak mo na Wala namang batas against cursing the church so anong magiging basis ng Supreme Court? Ache, are you with us? I mean not politically speaking but in terms of being present in the same universe? Ache, I wrote about offending religious beliefs in my column before in The Manila Times, check mo kung may time kang magbasa --- you know reading is fundamental - at hindi pagpapa-aquanet ng buhok ang inaasikaso mo. "Article 133 of the Revised Penal Code [the one that Celdran violated] only prohibits offending religious feelings “in a place devoted to religious worship or during the celebration of any religious ceremony.” Outside those contexts, religious feelings aren’t protected from being offended. The Constitution doesn’t prohibit mocking any god. What it prohibits is any “religious test…for the exercise of civil or political rights.” That means the exercise of any civil or political right, such as freedom of expression, cannot be restricted by one’s religious belief, renouncement, or even mockery of such beliefs. If your belief is that the god of a particular religion is stupid, that belief isn’t prohibited from being expressed. Doing so would be tantamount to having a religious test for freedom of expression."